ADFs can't survive for very long in the open air. If they are out of the water for more then 15 or 20 minutes, they will dehydrate and die. That's why it's so important that African dwarf frog habitats be fully-covered with an aquarium lid or a similar cover that contains no holes. If your frogs hop out of the tank and no one is around to place them back in the water, they will die. Another thing to remember about African dwarf frogs is that they must be able to swim to the surface to breathe air. Make sure that there is enough space between the top of the water and the aquarium hood for them to breathe, and avoid decorations that might trap them and prevent them from surfacing for air. There are four species of African dwarf frogs. The ones usually sold in pet stores are Hymenochirus boettgeri. As their common name implies, they are native to Africa. In nature they live in shallow, relatively still pools of fresh water or in shallow areas of gently-flowing rivers and streams. In nature and in captivity, African dwarf frogs are loosely nocturnal. Given a choice in the matter, they would prefer to be fed at night, which is when they would do their hunting and foraging in the wild. But it's a very loose preference. In captivity, they adapt just fine to a diurnal (awake during the day) schedule. I recommend feeding your frogs during the day so you can see and remove any uneaten food promptly. ADFs are omnivores by nature and will eat pretty much anything, alive or dead, that they can get in their mouths. They are opportunistic feeders who fill themselves with food when they find it, but who can (and should, in captivity) go without eating for a day or two in between meals. You can read more about feeding your frogs here. 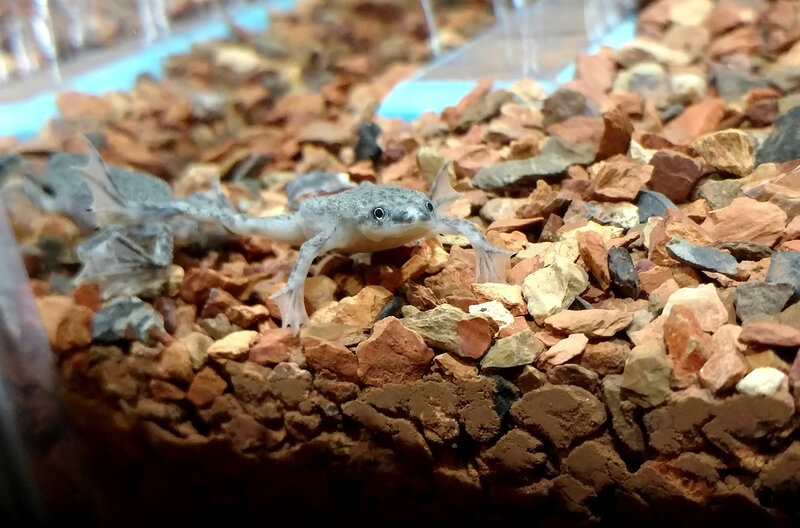 There is another specie of frog known as African clawed frogs (Xenopus Laevis) which are often mislabeled as African dwarf frogs in pet shops. African clawed frogs can also be kept as pets, but they are much more aggressive than African dwarf frogs. I don't recommend them for beginning keepers. There's nothing wrong with keeping African clawed frogs, but they're trickier to care for because of their aggressive tendencies. 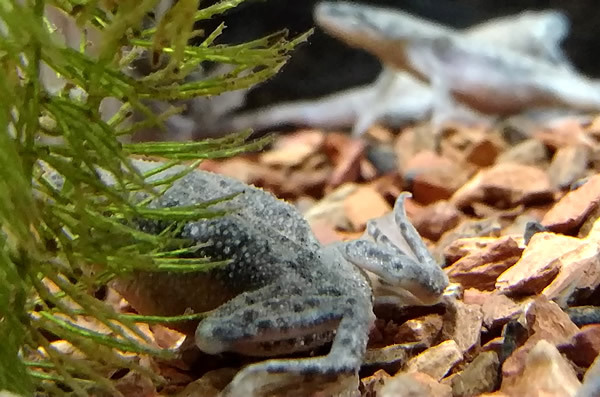 Because African clawed frogs are so frequently mislabeled as African dwarf frogs, it's important to make sure that you're buying the correct specie of frog. The easiest way for beginners to tell the difference is to look at the front feet, which we usually call the frog's hands. The African dwarf frog's hands have webbing between the fingers, which you can see in the picture at the top of this page. The African clawed frog's hands do not have webbing. The fingers are separate and form claws. You want the frogs with webbed hands if you want the frogs this site is about. The other differences between African dwarf frogs and African clawed frogs are harder for beginners to compare, but I'll mention them here for the sake of completeness: The eyes of the African dwarf frog are on the sides of their heads, whereas the African clawed frogs eyes are on top of their heads; and the African dwarf frog's nose is pointier than the African clawed frog's. A tank that's big enough, but not too big. One gallon of water per frog is the minimum. The tank shouldn't be too high, however, or the frogs may not be able to surface to breathe. You can read more about frog habitats here. Clean, relatively calm water. ADFs are very sensitive to water quality. You can read about achieving and maintaining water quality here, and about water filters and filtration here. You should also avoid moving the water around too much. ADFs don't do well in strong currents. Company. ADFs are not social animals in the scientific sense, but they are gregarious animals who do best with others of their own kind. I suggest three frogs at a minimum. A single ADF will be very unhappy in a tank all by itself without any friends. Days and nights. African dwarf frogs don't need expensive UV lights like reptiles do, but they do need days and nights. We provide that for them using aquarium lights that are either turned on and off manually or controlled by an aquarium light timer. You can read more about ADF lighting requirements here. Warmth. Like all amphibians, African dwarf frogs are cold-blooded animals. Their bodies take on the temperature of the water around them. We need to keep their water temperature in the range of 75 - 78 degrees Fahrenheit ( 24 - 26 degrees Celsius) using an aquarium heater of a sufficient size for the tank. You can read more about heating an African dwarf frog tank here. A proper diet. In nature, African dwarf frogs eat a wide variety of foods. As keepers of captive frogs, it is our responsibility to provide a varied and suitable diet. You can learn more about ADF's nutritional requirements here. A gentle keeper and a safe environment. African dwarf frogs are very delicate animals who should not be touched any more than absolutely necessary (which is almost never). Their environment also needs to be free of sharp gravel, plastic plants with sharp edges, filter inlets big enough to draw in a hand or foot, or other things which could hurt the frogs. Both male and female African dwarf frogs reach sexual maturity at about nine month of age. Female ADFs are a bit larger and plumper than males, especially when they're gravid (carrying eggs) or "eggy," like the female frog in this picture. They also have a cloaca at their rear ends, which is visible as a small bump between their hind legs. They use this opening for both laying eggs and passing wastes. Mature male ADFs have subdermal glands that are barely visible as white or pinkish bumps on the backs of each of their front legs, close to what would be their armpits if they were human. These glands have something to do with the mating process, but we're not sure exactly what that role is. Males also "sing" when they're in the mood for love. Their singing can often be faintly heard outside the tank and sounds like humming or buzzing. African dwarf frogs mate using a method called amplexus, or amplexing. The male frog mounts the female frog from the top and rear, embracing her by placing his arms around her waist, behind her arms. The female then starts swimming around rapidly and doing all sorts of maneuvers in the water, taking the male along for a wild ride, and laying her eggs near the surface of the water while the male fertilizes them externally. Amplexus goes on until the female has released all of her eggs. It can last anywhere between 30 minutes and several hours, occurring in short bursts separated by "resting" periods spent at the bottom of the tank. Most likely she is moving her eggs inside her body toward her cloaca during the resting periods. The male will continue holding on to her the whole time. When the male is embracing the female, they are said to be "in amplex" or "in amplexus." When the female has expelled all of her eggs, she will go limp and may actually appear to be dead. Whether this is from exhaustion or as a deliberate signal to the male that they're finished is unknown. I suspect it's a little of each. Whatever the case, when the female goes limp, the male will release her from his embrace, swim away, and resume his normal activities. The female will do the same very shortly thereafter. The eggs will hatch somewhere between two and seven days later. Raising tadpoles is not a beginner-level skill and is beyond the scope of this site. But if your frogs mate and you want to give raising tadpoles a try, I suggest you visit this page to learn how. It's a lot of work, but it's not very hard work.